Art has long been a way of teaching people. Statues and icons were used to teach others since ancient times. Often, art was used for religious instruction, from stone depictions of ancient Greek and Roman gods to the amazing Sistine Chapel. Art told history, from paintings of battles to portraits of Kings. Without art, an amazing portion of humankind's history would be gone. But Michaelangelo didn't one day wake up and say "I'm going to paint the entire Bible on a ceiling." He spent his youth copying paintings, and was eventually apprenticed to a Master Painter. He learned his craft by practicing. It's not just the finished product that teaches (though it is how the viewer learns), but the process of learning how to match and blend colors, to apply paint, or how much or little to trim away teaches the artist. The practice and learning is why I love arts-and-crafts. It's also not just about "art." Through art, you can learn so much about other subjects: anatomy of an animal (like the parts of a turtle), chemistry of a cake, or bringing a Bible Story to life. For children who struggle with fine motor skills, art can be great therapy - using scissors helps with strengthening small hand muscles, and painting helps work on eventual pencil gripping and writing. Arts and crafts can also help children with speech issues express themselves. Often, Jude is so busy crafting that he forgets to focus on his speech and doesn't try so hard. Sometimes it makes it easier to understand him. Sometimes also he does a better job of showing me than explaining - he may not be able to tell me how a square folds into a triangle, but he can show me and I know he understands to concept. This week, I want to share our love for arts and crafts with you. There are so many things to be learned by crafting! 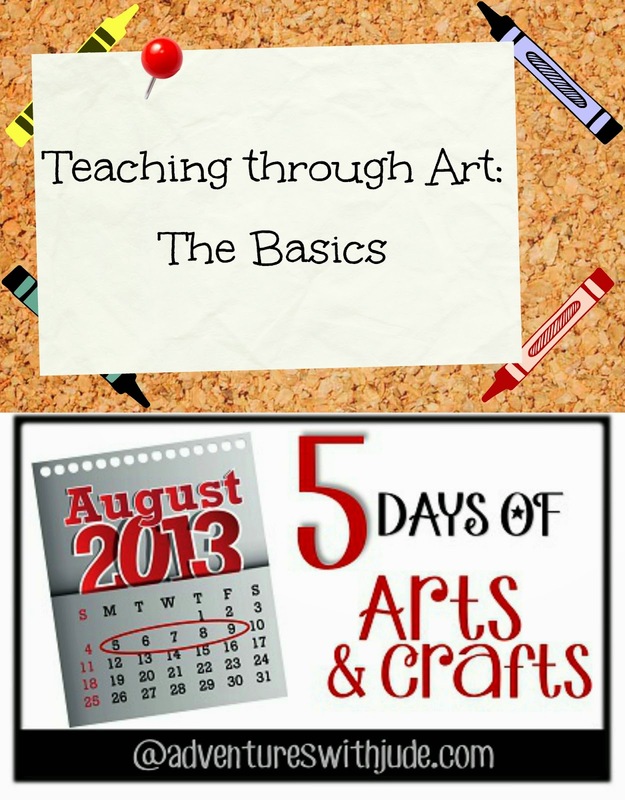 Through the rest of this week I'm going to share some of our favorite art projects and some other ideas for crafting. I love collecting craft ideas. Jude is very motivated by them, and some sort of project (from painting to building to baking cookies, depending on our day's schedule) is always the grand finale of our school day. In order to do almost daily crafts, it means keeping a well-stocked "craft pantry." This is what I always keep on hand. With these basic items, you can do pretty much anything. I will be honest and say I am a little bit of an art supply snob. For some things, you can get the inexpensive options (google eyes, pipe cleaners, store-brand copy paper). However, for things like crayons, I will only buy Crayola - you get what you pay for, and I think they hold up better than other brands. And do yourself a favor - spend a few extra pennies on the washable versions of markers and paint. Yes, it IS possible to get Sharpie out of a new T-shirt, but I can think of a LOT better things to do than babysit the washer. Crayons - for younger children, boxes with no more than 16 or 24. Otherwise, it's too many colors and gets overwhelming. Sometimes I think the box of "just 8" really is enough, but often the larger boxes are the cheap ones. I buy 20-30 boxes over the summer during the "Back to School" sales, because the box that is 50 cents in August will be two dollars and fifty cents in January. Markers - both fine and broad tip. I keep a pack of Sharpie-style markers on hand for when I need a permanent marker, but the use of them is VERY closely supervised! For general use, I highly recommend washable ones. Poster paint - here's where you can go super-minimal, or more colors than the rainbow. If you start with primary colors (red, yellow, blue) plus black and white, you can make pretty much any color. I usually also keep on hand a few "neon" colors (like electric blue and hot pink), and some glitter paint. There is something just magical about glitter paint! Paintbrushes - different sizes and textures are great. I generally keep standard watercolor brushes (buy cheap and in bulk! ), some thicker ones with chunky handles, and a few small sponge ones. Paintbrushes also do double duty when applying glue over large areas. Felt - a large bag of multicolors. Keep any larger scraps in a separate bag - you often may be able to reuse them. Fabric remnants - I will check out the remnant rack at Jo-ann's, or get some fat quarters on sale. I hope you'll join me all week as we spend our time together crafting! This is a really great list! I'm going to print it out and hang it on the inside of my supplies cabinet. Looking forward to seeing all your ideas this week.